The staple of the Olympia brand has long been their Airglide Jacket. For 2013, we are getting a re-fresh of the style as well as some improvements to keep the ball rolling. Available this Spring, we expect the Olympia Airglide 4 Jacket to be a home run, in sequence with Olympia's well-established pedigree for this model. Though it may not seem possible, the most substantial upgrade to the Olympia Airglide 4 is actually more airflow! Olympia has added several key mesh panels to improve ventilation, mainly across the outside of the arms. 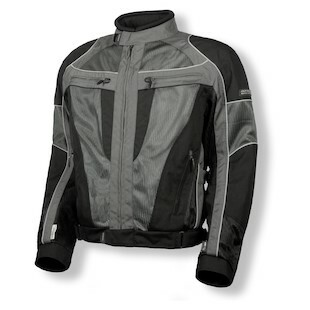 However, the 500D Cordura textile shell still exists as the protective framework to which the mesh is sewn. In addition, the front and back paneling have been re-designed for a fresh new look as well as a more optimized positioning of Cordura vs mesh. The interior destination liner has also been redesigned and now includes a stand-up collar and a better overall finish to help seal out the cold. Carried over from the Airglide 3, this liner is two stage, providing both a waterproof membrane and Thermolite inner layer. Olympia will be launching the jacket in 4 distinct colors: Black, Silver/Pewter, Pewter/Black, and HighViz/Black. While we may not see additional color this year, we anticipate the addition of other options down the line as is the usual pattern. 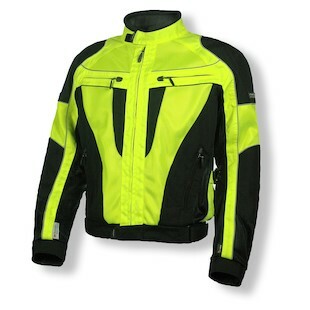 Particularly with the High-Viz/Black, you can see the attention to detail with the bold styling and clean color blocking. High-Viz is no longer just a function, but now a fashion. One other point of note: Olympia is now shaping their sleeves slightly thinner so as to help keep the armor more stable against your shoulder and elbow. However, you will still have the ability to adjust the sleeve as needed. We hope to see this begin shipping in February 2013, just in time for that first thaw of Spring!